Do you know your Ice Wine? Here in India few of us drink, let alone think of, ice wine. In fact, relatively small amounts of ice wine are produced in the world each year. But on January 5, the Canadian Embassy hosted an ice wine tasting led by Professor Ramesh Srinivasan of Humber College Institute of Technology & Advanced Learning giving us an excuse to talk about these fascinating but not so well known wines. So what is ice wine? It is a type of dessert wine produced from grapes that have been frozen while still on the vine. The sugars and other dissolved solids do not freeze, but the water does, allowing a more concentrated grape must to be pressed from the frozen grapes, resulting in a smaller amount of more concentrated, very sweet wine. Interestingly, in the case of ice wines, the freezing happens before the fermentation, not afterwards. 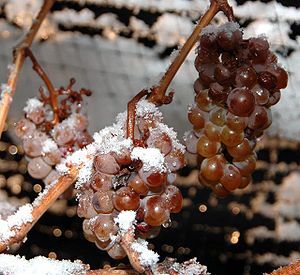 There are indications that in Roman times frozen grapes were first used to make ice wine. It is believed that the first post-Roman ice wine was made in Franconia in Germany in 1794. Today ice wine is produced in Australia, Austria, Canada, Croatia, Czech Republic, France, Germany, Hong Kong, Hungary, Israel, Italy, Luxembourg, New Zealand, Slovakia, Slovenia, Sweden and United States. However, it is fair to say that the most expensive and popular ice wines are produced in Germany and Canada only. Canada, particularly the Niagara Peninsula, is the largest producer of ice wine. Inniskillin Wines is the most widely recognized Canadian ice wine producer and was also the first to win international recognition in terms of the Grand Prix d’Honneur at 1991 Vinexpo in France, with their 1989 Vidal Icewine. Pillitteri Estates Winery is another popular Canadian ice wine maker. While many different grapes can be used in the production of ice wine Riesling and Cabernet Franc are the most commonly used ones. So how does ice wine taste? Ice wine is very refreshing due to its high acidity. It is typically medium to full bodied with a long finish. The nose is reminiscent of peach, pear, dried apricot, honey, citrus, figs and green apple though that may vary depending on the varietal. The aroma of tropical and exotic fruits is common mostly in the white varietals. Ice wine typically has a slightly lower alcohol content than regular wine especially among the German ice wines. Watch for a write up of the tasting in Sommelier India soon. Next Article Chianti and Chianti Classico. Are they the same?